Is Drake Collaborating With Afrobeats Artist Tekno On His New Album? Drake has been busy in the studio. Drake has sparked rumours that he will be working with Afrobeats artist Tekno on his highly-anticipated new album. Drizzy, who recently finished his ‘The Boy Meets World’ tour, has shared a picture of himself deep in discussion with the Nigerian singer-songwriter. On ‘Views’ and ‘More Life’, Drake experimented with a series of dancehall and Afrobeats songs such as ‘One Dance’, ‘Madiba Riddim’ and ‘Get It Together’. And now Drake seems to heading in a similar musical direction. Tekno is currently best-known for his Afrobeats anthem ‘Pana’. After spotting the pictures on social media, fans have expressed a mixed reaction. Tekno better not give Drake all the secrets to this Afro Beats ting or give out all the dope beats he’s meant to keep for himself. We all know Drake is a culture vulture. Nigerians now celebrate pictures more than they celebrate the song, fact is wizkid gave Drake the biggest song of his career. Drake won't top that. Congrats to Tekno, but he should be wise and protect himself. Drake is a vulture. Bye. 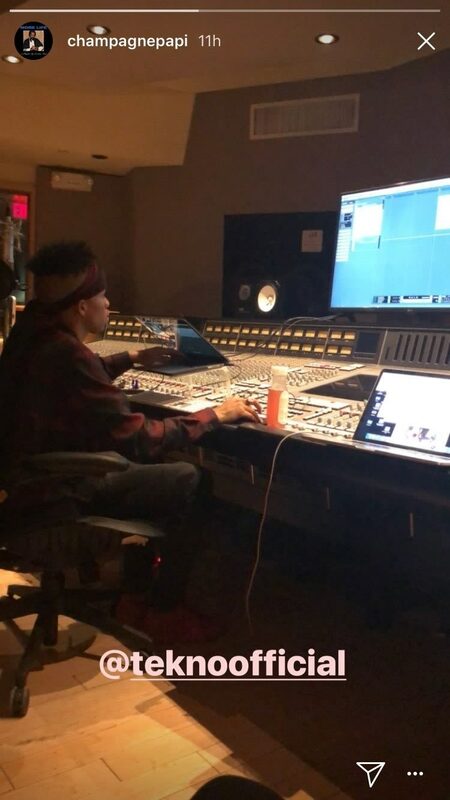 Tekno is a gifted producer, he has produced a lot of smashing hits this year, it is understandable that Drake chose to work with him based on the success of some of the hit songs he produced this year. Congrats @alhajitekno, putting Nigerian and the Afrobeat sounds on a pedestal. Meanwhile, Drake recently confirmed that he is planning to finish work on his new album, after teasing news songs on his recent tour of New Zealand and Australia.